When was the last time you escaped the stresses of everyday life and relaxed at a spa? 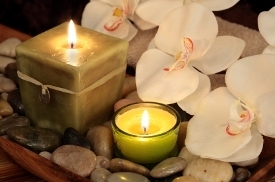 Naperville has a nice selection of spas where you can pamper yourself and your loved ones. In addition to hair and nail services, many Naperville spas offer relaxing massages, deep cleansing facials, and specialized body treatments to help rejuvinate and refresh you. A Spa gift certificate is a wonderful way to say "I Love You" and is perfect for a birthday or anniversary present. We've compiled a list of Naperville area spas, along with links to further details about each one. •	Golden Serenity Spa - Located near Westfield Fox Valley Mall, Golden Serenity offers the best in health and beauty treatments, but their advanced medical solutions is what sets them apart.